The average price of Xbox Live Arcade games on the Xbox 360 has risen by a $1.74 since the Xbox 360 launched in November of 2005, according to Kotaku's study of prices for more than 200 XBLA games. Microsoft's annual Summer of Arcade promotion begins today, a five-week event designed to draw attention to new top-flight Xbox Live Arcade games, such as Splosion Man and Shadow Complex. We don't yet know how good these games will be — though we have high hopes. What we do know is that they, as is the trend with XBLA games, will contribute to the rising price tag of games on Microsoft's downloadable service. 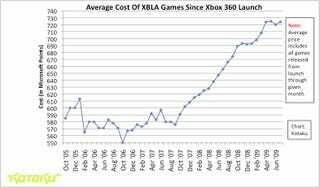 The average price of an XBLA game in the 360's first month was just under 600 points at about $7.31. That has risen to more than 700 points as of last week, or $9.05. And that's not counting how the average will likely rise again during the Summer of Arcade. Four of the five games offered for the new promotion will run 1200 points. The second chart Andrew and I made shows which prices have been popular, and which are going out of style. The days of games released for 400 points ($5) are nearly over. The 1200-point price ($15) is increasingly common. The size of games offered through XBLA has increased over the years. Several top-quality titles, including Geometry Wars, Braid and Battlefield: 1943 have garnered acclaim. But if you thought that XBLA was becoming a more expensive service, you're not imagining things.